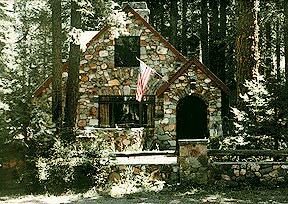 A German stone mason, known for having laid part of the Fleur de Lac's original stone work, built this home in the early 1940s. He chose and hand cut every stone for his house's exterior, fence, and living room. All the stones came from California and Nevada, and apparently there are none of these colorful varieties left. His wife was Indian, and locals remember her in the yard gathering branches to build a fire in the Dutch oven her husband had built into the grand stone fireplace . The second owner, was a carpenter who helped dismantle the Tahoe Tavern. He salvaged some of the Tavern's solid oak mirrored doors and added built-in pine cabinets and cubbies to add to the house's charm. This house was the perfect "project" for its third owner, who liked to keep busy. The inside plaster walls had been painted burgundy and the drapes were corduroy. She painted everything white and put lace curtains in the windows. The theater lights in the living room had also been painted over, so she stripped those down as well and they provide an elegant charm to the living room. The floors are birds eye maple, the French windows contain the original iron frames, and the molding is the original plaster. With its grand stone wall, the living room is surprisingly light, even on a snowy day. It would take many visits to discover all the unique features of the Stone House: the odd shaped rooms, unique woodworking, sponge paintings on the plaster in leather tones, edged with a hand painted red and white border. 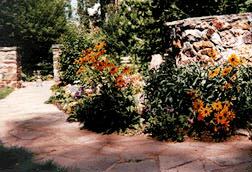 During the 20 years the third owner lived in the Stone House, she planted numerous cedar trees, fields of shasta and lupine, and borders of brown-eyed susan along the flagstone pathways. We'll keep you posted on what the home's new owners have planned.